If you have a furry, four legged family member than you know exactly how inconvenient it is to take your dog to the groomer’s every time that he or she needs a bath. On average most pet owners partake in grooming services on a monthly basis, but as we all know that Fido tends to get dirty a lot more often than that. When your dog needs a bath, why mess up your own shower or tub? Clogging the drain with all of that fur is simply not a good idea. As a matter of fact it can actually lead to expensive plumbing repairs. The other option that some people attempt is to bathe their dog outside with a garden hose. If you have tried that then you know exactly how frustrating the process can be for both yourself and your pet. The good news is that there is a solution that will make life a heck of alot easier for you. Just imagine how convenient it would be to have a glass enclosed doggie wash station in your laundry room or mud room that is dedicated to your best friend? 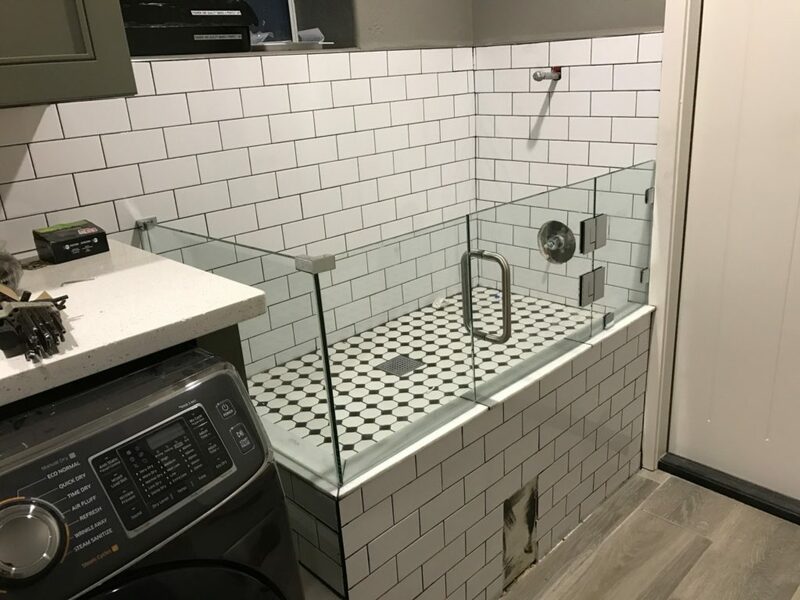 Although the best time to install one is during a remodel or new construction, adding a glass dog shower certainly is not a daunting job when the rough plumbing is already in place. A Cut Above Glass will guide you through the entire process from the design stage to the installation phase. We will even provide you with advice on upkeep including the best glass cleaning methods. Adding a glass-enclosed pet washing station to your home is basically the same exact process as installing a glass shower except it is to a smaller scale. Once the design work is completed and approved by the homeowner, A Cut Above Glass coordinates with a team of expert plumbers and experienced tile contractors to execute the installation process. For example, the plumber will begin by putting in the shower pan or basin. They will then install a commercial drain that can easily handle an excessive amount of pet fur and or hair without clogging. The plumber will also hook up the fixtures, such as the showerhead, and spray hose to the rough plumbing. The tile contractor will lay and grout the tile for the walls, tubs, and shower surround. Last but certainly not least A Cut Above Glass is responsible for the installation of the glass partition walls and glass shower door. We actually custom manufacture all of the glass panels and install the hardware as well. When planning the initial design of the glass enclosed doggie wash station it is extremely important to consider the size of your dog. Most laundry rooms or mudrooms have small footprints. The unit must be large enough to fit your pet without taking up too much space. If you are considering or planning on having a pet shower in your laundry room or mudroom we suggest that floor of the room itself is constructed with tile. That way you will avoid water damage to the floor and have a much easier time cleaning up after your dog has his or her much needed bath. A Cut Above Glass is the leading designer and installer of frameless glass shower enclosures in Scottsdale, Arizona and surrounding areas. Please contact us today for an initial consultation regarding glass enclosed doggie wash stations, and any other of your glass related needs.